The Wars of the Roses were a series of wars for control of the throne of England fought between the House of Lancaster, whose symbol was the red Rose, and the House of York, whose symbol was the white Rose. When Henry VII of the House of Tudor won the throne in battle against the last King of the House of York, Richard III, the Wars of the Roses ended. On his marriage, Henry VII adopted a badge conjoining the White Rose of York and the Red Rose of Lancaster, which became known as the Tudor Rose. 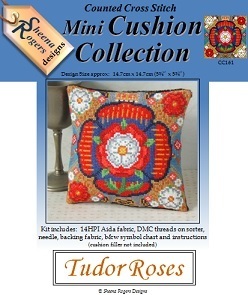 These roses have now been brought together in this cross stitch design, full of rich and vibrant colour, with the Tudor Rose taking centre stage, topped with the crown of the King of England. Only whole cross stitch is required to complete this design.